The monthly meeting speaker programme for 2018 is now available on the What's On webpage. Anne Townsend. The programme for 2018 for Wine Tasting is now available on the Wine Tasting webpage. Neil Franklin. The programme to August 2018 for Science Technology and Research (STAR) is now on the STAR webpage. Chris Mason. The programme for the first six months of 2018 for Putting the World to Rights (PTWTR) is now on the PTWTR webpage. Stan Miller. 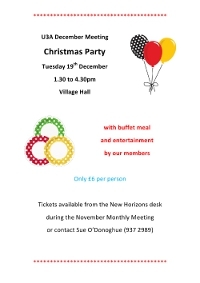 The December Monthly Meeting Christmas Party is to be held on Tuesday 19th December in the Village Hall from 1.30 to 4.30pm, with buffet meal and entertainment from our members. Tickets only £6 per person, available from the New Horizons desk at the November Monthly Meeting. At other times please contact Sue O'Donoghue (937 2989). Click flyer image or this link..
Short Walk Tuesday 21st November 2017 - we meet at the Village Hall Car Park at 10.30am for cars. The walk is at Attenborough Nature Reserve. For more information about the walks please visit the Walking webpage. Gloria Wright. Short Walk Tuesday 17th October 2017 - we meet at the Village Hall Car Park at 10.30am for cars. The walk is a circular route to be announced. For more information about the walks please visit the Walking webpage. Gloria Wright. Short Walk Tuesday 19th September 2017 - we meet at the Village Hall Car Park at 10.30am for cars. The walk is a Bunny circular. For more information about the walks please visit the Walking webpage. Gloria Wright. The Listening to Music programme for September to December 2017 is now on the Listening to Music webpage. Bill Cooper. The next STAR Group Meeting will be held on Monday September 4th at 2-00 PM in the Methodist Church Selby Lane. Lauren Baker from The University of Nottingham has kindly offered to talk to us about her work. She will give a Presentation called "You are what you WHEAT - Breeding ‘alien’ species with wheat to feed the world." National AGM 31st August Live Streaming. For the first time, those who are not able to attend the Annual Conference to be held at the East Midlands Conference Centre, Nottingham, can watch the AGM day live on the internet. To access the AGM live stream, visit https://conference-2017.u3a.org.uk/live on 31st August. 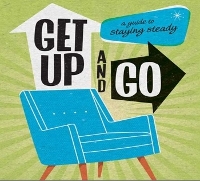 The whole day will be broadcast so tune in from around 9am to catch the morning speaker, Jo Coleman. The full programme is available at https://conference-2017.u3a.org.uk/programme/thursday/. Short Walk Tuesday 15th Aug 2017 - we meet at the Village Hall Car Park at 10.30am for cars. The walk is a Beeston circular. For more information about the walks please visit the Walking webpage. Gloria Wright. Short Walk Tuesday 18th Jul 2017 - we meet at the Village Hall Car Park at 10.30am for cars. The walk is a Keyworth to Normanton circular. For more information about the walks please visit the Walking webpage. Gloria Wright. The Science, Technology and Research Group (STAR) would like to invite New Members of K&D U3A to attend our next session on Monday August 7th. Paul Roebuck has kindly offered to give a presentation based on a display of products that we commonly use in our homes and to describe the chemical properties (both beneficial and potentially dangerous) of those items that we use so regularly. For more information and a list of the categories of product please look at this information sheet. Short Walk Tuesday 20th June 2017 - we meet at the Village Hall Car Park at 10.30am for cars. The walk is around Wollaton Park. For more information about the walks please visit the Walking webpage. Gloria Wright. The next meeting is on Monday 5th June at 2.00pm in the Keyworth Methodist Hall. Dr Susannah Lydon will be giving a talk with the title ‘More than Dinosaur Food’. The plant fossil record tells us an astonishing story of evolution, changing ecosystems, and climate change. The Listening to Music programme for May to August 2017 is now on the Listening to Music webpage. Bill Cooper. Short Walk Tuesday 18th April 2017 - we meet at the Village Hall Car Park at 10.30am for cars. The walk is around Compton Acres. For more information about the walks please visit the Walking webpage. Gloria Wright. The latest Heraldry Group article on their Feignies Room sessions from October to February (an extended version of the Spring Newsletter article) has been added to the Heraldry webpage. Vic Taylor. Short Walk Tuesday 21st March 2017 - we meet at the Village Hall Car Park at 10.30am for cars. The walk is around Willoughby Woods. For more information about the walks please visit the Walking webpage. Gloria Wright. or please contact me. I have posters and flyers that I can also send to you. I hope this is something that your members would find interesting and look forward to hearing from you. The Programme for 2017 for the Cycling group is now on the Cycling webpage. Roy Turnbull. The Programme for 2017 for the Architecture and Archaeology group is now on the Achitecture and Archaeology webpage. Sheila Barton. Short Walk Tuesday 21st February 2017 - we meet at the Village Hall Car Park at 10.30am for cars. The walk is around Ruddington. For more information about the walks please visit the Walking webpage. Gloria Wright. The Listening to Music programme for January to April 2017 is now on the Listening to Music webpage. Bill Cooper. The 2014 news items are in the News 2014 Archive. The 2013 news items are in the News 2013 Archive. The 2012 news items are in the News 2012 Archive.